See the supplementary data files for the book. Who and what a government taxes, and how the government spends the money collected, are questions of primary concern to governments large and small, national and local. When public revenues pay for high-quality infrastructure and social services, citizens thrive and crises are averted. When public revenues are inadequate to provide those goods, inequality thrives and communities can verge into unrest—as evidenced by the riots during Greece’s financial meltdown and by the needless loss of life in Haiti’s collapse in the wake of the earthquake. In The Public Good and the Brazilian State, Anne G. Hanley assembles an economic history of public revenues as they developed in nineteenth-century Brazil. Specifically, Hanley investigates the financial life of the municipality—a district comparable to the county in the United States—to understand how the local state organized and prioritized the provision of public services, what revenues paid for those services, and what happened when the revenues collected failed to satisfy local needs. 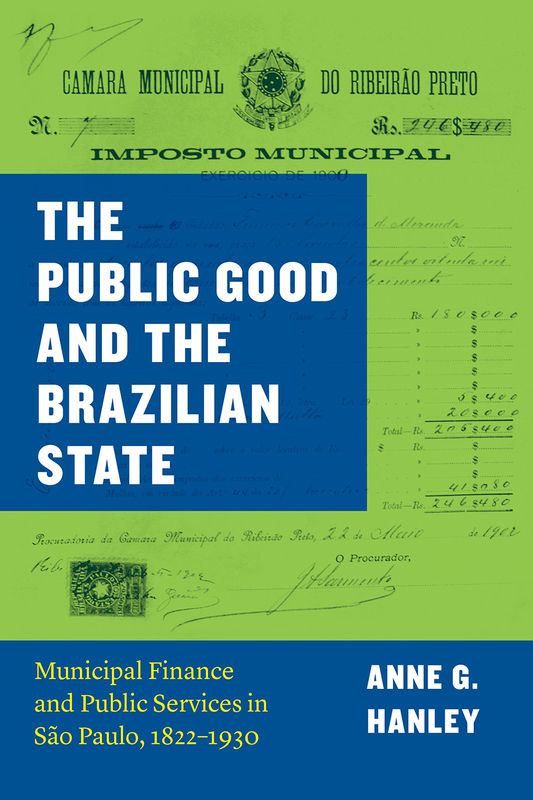 Through detailed analyses of municipal ordinances, mayoral reports, citizen complaints, and financial documents, Hanley sheds light on the evolution of public finance and its effect on the early economic development of Brazilian society. This deeply researched book offers valuable insights for anyone seeking to better understand how municipal finance informs histories of inequality and underdevelopment.